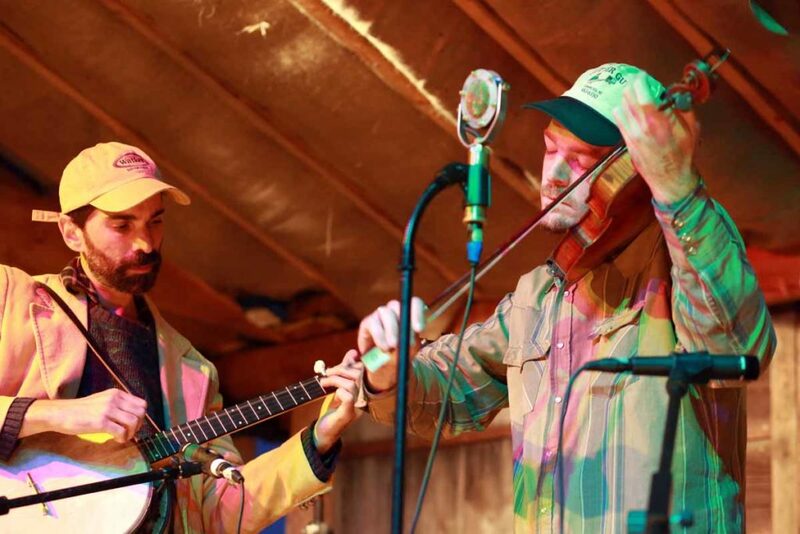 The Down Hill Strugglers, Eli Smith on banjo, Jackson Lynch on fiddle, will be at the Oldtone Music Festival which opens September 6 at the Cool Whisper Farm in North Hillsdale, New York. Sheffield — This past Sunday morning the “Oldtone Crew” was in full swing at Dewey Hall employing equal parts careful effort, minimal instruction and YouTube videos in order to tackle a rather ambitious screen-printing project. T-shirts were ordered from an online store, Kip Beacco designed the graphics, and Crispina ffrench of Dolphin Studios did a fast photo emulsion screen for the crew of five. 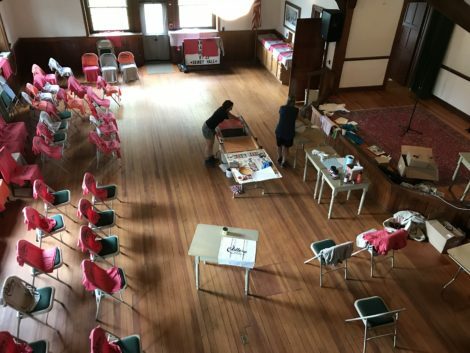 On Sunday at Dewey Hall in Sheffield, T-shirts were being prepared for the Oldtone Music Festival that begins Thursday, Sept. 6, in Hillsdale, New York. The collaboration that ensued along the makeshift production line — assembled for the purpose of screen-printing the staff, security and volunteer t-shirts for this weekend’s music festival — is symbolic of the coming together required for such an ambitious endeavor. Nine hours and 150 double-sided t-shirts later, despite the volunteers’ relative inexperience with silk screening, the team was one step closer to the September 6th opening of “The Annual Oldtone Roots Music Festival” held this year at Cool Whisper Farm in North Hillsdale, New York, for the 4th consecutive year. 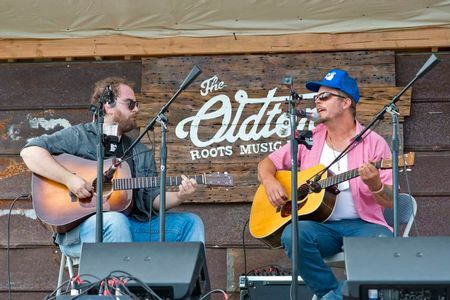 “When you step back and see it clearly, from a distance, you notice this collaborative stream that almost seems to have grown organically,” said Kip Beacco who — along with Jim Wright and Matt Downing — founded the Oldtone Roots Music Festival in 2015. 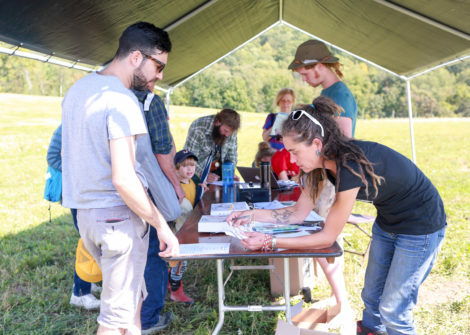 What began as a startup day-long festival at The Lantern in Wassaic, New York, has expanded into a four-day camping festival featuring 30-plus bands on three stages. The Oldtone Roots Music festival, on a mission to preserve American Roots music and dance, features hand-picked artists dedicated to unique American traditions. Oldtone musicians play the old songs in the old ways, and compose new songs in the old styles. The event is an intimate and hands on experience where audience members have opportunities to engage directly with the artists. “Oldtone has the feel of a farmer’s market, with a mellow social vibe,” explains Beth Carlson, who joined the founding team in 2016. “The Festival has a lot of music and activity, but the atmosphere once you arrive on site is very mellow,” she explains. The varied scope of music — including Cajun, Gypsy Jazz, New Orleans jazz, bluegrass, and Mountain Music — is just one draw. “Attendees can wander from Main Stage to the workshop tent to the Dance tent, catch Roger the Jester on one of his roaming performances, pick up a beer or a quesadilla from a vendor, all in a relaxed manner,” Carlson adds. The producers — Wright, Downing, Beacco and Carlson — are dedicated to preserving the oral tradition art forms of Roots music. Oldtone’s motto, “participation is preservation,” stems from a belief that participating in these arts is the only way to ensure they are shared and taught. In addition to a carefully curated and exciting Main Stage line-up, the Oldtone Dance Tent has the most beautiful view from any dance floor on the East Coast — situated on a ridge at the top of a valley — and offers a wide range of dance experiences, classes, community dances, called dances and couples dancing. Nights in the dance tent have a party atmosphere with well-known and dynamic callers and teachers and the hottest bands in square, contra, swing, Cajun, and honky-tonk two-step. In the Workshop Tent, Oldtone Main Stage performers offer hands on classes for attendees in an intimate setting all inclusive in the ticket price. The Festival’s goal is to offer positive experiences with Roots Music and Dance for attendees of all ages, including family and children focused performances and interactive classes. 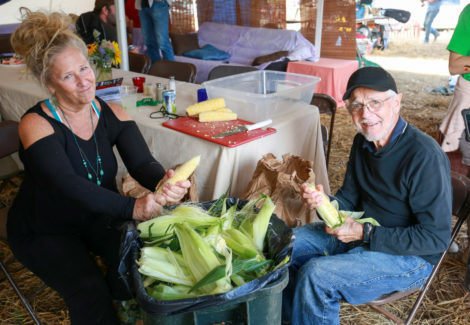 The Festival also features local food, craft and vintage vendors. Oldtone organizer Matt Downing stated: “The food this year is going to be great. We’ve got some of the best Hudson Valley and Berkshire County farm-to-table vendors, and great stuff for children” both of which contribute to the unique, regional flavor of the weekend. For tickets and information, visit www.oldtonemusicfestival.com, or consult The Berkshire Edge calendar.